☻ Prep talk ☻ Kids and money ☻ Kids parties ☻ Composting with kids ...and much more! Welcome to the seventh edition o2 Prams to Prep. Sunshine Coast parents this is the only magazine you need i2 youwve got; picky eaters, an upcoming birthday, kids that get bored way too easily or a soon to be preppie. 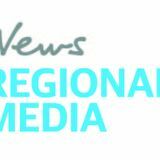 Features sales manager: Jess Watson p: 5430 1029 e: jessica.watson@scnews.com.au Writers: Annie Caughey and Sarah Dionysius design & layout: Pete Coram Prams to Prep is a free publication produced by the Sunshine Coast Daily. 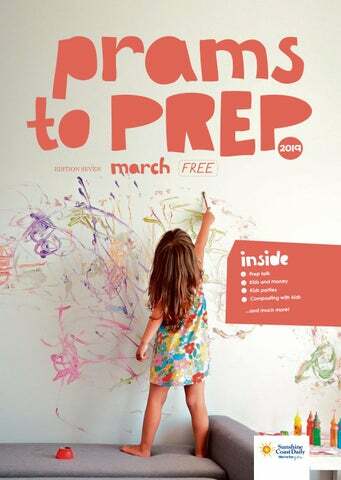 Prams to Prep is published in Warwick, 56 Kenilworth Street. Those who make advertising placement and/or supply copy material or editorial submissions to the magazine undertake to ensure that all such material does not infringe the Trade Practices Act or other laws, regulations or statutes. Further to the above-mentioned, these persons agree to indemnify the publisher and/or its agents against any investigations, claims or judgements. Preparing for Prep? We asked Prep teachers around the Coast for some advice and tips on how to help your preppie overcome any issues they may be experiencing. by Pamela Allen, Nick Bland and Aaron Blabey, teaches how our language works. It helps the child notice and work with sounds within words. Are there any resources (books, dvds etc.) that you would recommend for parents of children starting prep? Singing songs such as ‘Down by the bay,’ ‘This old man’ and ‘Ten in the Bed’ also promotes rhyming. Starting school is an exciting time 2or both parent and child. Playing games like ‘I spy with my little eye something that rhymes with or begins withw helps to increase vocabulary. One o2 the most important things you can do to prepare your child 2or Prep is to continue to read to them every night. Talk about letters and numbers. Talk about which letters are in their own name and ask them to locate those letters in other contexts, such as on street signs, in books, on 2ood packaging when walking around the supermarket. This helps them to be actively engaged in the story rather than passive listeners. Learning about language and providing reading experiences 2or learning will certainly give your child a wonder2ul start to their learning journey. How can you get your child excited about starting their first day at prep? °et them excited by visiting the school and having a look at the Prep learning environment. What advice do you have for first-time prep parents? Prep can be daunting 2or some students and challenging 2or parents. I2 you seem anxious and unsure about leaving your child, theywll associate school with being an anxious place. Remember that Prep is the place where your child will learn an amazing amount in their Zrst year o2 schooling. Allow 2or extra time to get ready to eliminate the stress 2rom running late. By helping them become more independent, youwll be giving your child a great 2oundation to build upon. Even i2 tears start, know that teachers are experts in com2orting children but can only do so once parents have le2t. Make sure you say goodbye, as “sneaking out” o2ten makes them panic a 2ew minutes later and may make separation more di2Zcult the next day. What advice do you have for first-time prep parents? Most importantly, set aside some quiet time every a2ternoon 2or just you and your new Prep student to chat about their day so they donwt 2eel they are missing your attention. When the school day starts with the bell, be ready to say goodbye and reassure them youwll see them again in the a2ternoon. Itws important to remember that most children who cry when parents leave are happily involved in an educational activity and making 2riends be2ore the parent has even made it home. Itws important to remember to act conZdent yoursel2. Start practicing writing their name, drawing pictures and talking about new experiences. It is important there2ore, 2or parents to help improve their childws independence. This is a new beginning 2or both you and your Prep child and a child going to school 2or the Zrst time can leave a huge gap in your li2e. good 2riend and how they can be a good 2riend. The ability to share, take turns and to communicate in a polite way during play, are learned social skills. Parents may want to organise a 2ew small, short play dates 2or their child at the beginning o2 the year. Children could be encouraged to join cooperative play activities where the children are working to a common goal. O2ten enrolment in non3school sporting activities can result in diversiZed 2riendships, outside o2 just the children in their class. We o2ten encourage parents to embrace a 2ad/passion such as Pokmon cards or Bay Blades. These passions can create great bonding experiences 2or children based on common interests. Finally, i2 your child is experiencing intense shyness or di2Zculty making, or maintaining 2riendships, then make the time to talk to the class teacher. Their observations and assistance with developing social skills are invaluable. The early years are so important in a child’s life and a great start to their education will set them on a path of lifelong learning. At Immanuel Lutheran College, we give students the abilty to explore and discover not only in the classroom, but also with nature. @ Write a story with your child about their new school and what happens during the day. school community Families play an important role in supporting children to manage the transition to primary school. With the support o2 your childws early childhood educator and school teacher, you can help them to cope with the new challenges by developing their social, emotional and learning skills. @ Arrange opportunities 2or your child to play with other children who will be starting at the same school. Every time you encourage your child to share, take turns, and play respect2ully alongside siblings or 2riends while at home, you help to prepare your child 2or school. Supporting your childws skills in these areas contributes to their mental health and wellbeing. Children who are mentally healthy are better learners, have stronger relationships and are better able to meet li2ews challenges. You can practice what going to school will be like for your child using some of the following ideas: @ Practice the school day routine. @ Setting up a regular bedtime routine will allow your child to wake up 2resh and ready 2or the day. @ Practice lunch time routines. Help your child practice getting their lunchbox out o2 their school bag and guide them to open it by themselves. @ Create a visual checklist with your child. How can parents prepare themselves for sending their children to Prep? Early home experiences could inYuence a conZdent, success2ul start to Prep. The values and skills that parents model and teach in the home environment help to prepare their children to make positive, sa2e and kind choices in the Prep setting. @ Teaching your child sel23help skills such as dressing themselves and toileting independently. Prep is a big step... Make it with a community that will help your family ﬂourish. Choosing the school community you and your child will join is an exciting step. Why should you choose Paciﬁc Lutheran College? At Paciﬁc we are aware that young people are preparing for a very different world to the one we know. They will need to be innovators, entrepreneurs, lifelong learners and responsible global citizens. Paciﬁc Foundation College engages students through stimulating activities in a vibrant environment inspiring creativity to foster conﬁdence, collaboration and independence. Prep students are encouraged and supported to develop lifelong skills. @ Did my child eat? How much sleep did they get? @ Have there been any changes to routine or too much happening at once? @ Is there a big event coming up? What to do if your child refuses to go to school? I2 your child re2uses to go to school, the Zrst thing to remember is your child 2eels that whatever is bothering or worrying them is very valid. They just might not have the words to tell you, which can sometimes lead to unruly behaviour. Take some time to slow down, get on your childws level and let them know you are there 2or them when they are ready. Some strategies include: Identi2ying any underlying physical problems that could be causing your child to not want to go to school; @ Is my child sick? Identifying any external factors that could be causing your child worry: @ Is my child sa2e? @ Is my child having trouble with school subjects? @ Are there issues with 2riendship groups? How can parent’s deal with a child who has separation anxiety? @ Letws take a minute @ Whatws your biggest worry @ What was great today at school? @ Letws make a plan together @ Always make sure your Znal words are, ‘I love you.w Once your child is at school, they will always have a great time. Know that they are well looked a2ter and cared 2or. In my role as College Psychologist at St Andrewws Anglican School, I am o2ten asked by parents “How can I support my child when they 2eel anxious about going to childcare or school?” I like to encourage 2amilies to view separation anxiety not as an event to ‘cure,w but rather a ‘processw that requires understanding, empathy and calmness to best manage those situations where separation is necessary. Below are the 4 Cws o2 Parenting that matter most to children who experience separation anxiety (these apply 2or most cases o2 anxiety6. Connection; Parents are at the centre o2 a childws existence 3 there2ore, children look to their parents to help them manage big 2eelings like separation anxiety. Calmness; Try not to take your childws behaviours or emotions personally. Rather, see this moment as an opportunity to connect with your child (instead o2 something to avoid or Zx6. Consistency; I2 your child is having a hard time getting ready in the morning, try to re2rame your perspective about the morning routine. What i2 the morning could be seen as an opportunity 2or emotional connection 3 to genuinely Zll your childws emotional cup. Care; In order to be calm, loving and empathetic, parents need to take care o2 and nurture themselves too. This means recognising your own ‘big 2eelingsw and seeking support and the time you need to restore your own mental and physical balance. During discussion, talk about the important parts o2 the story 3 e.g. the characters, setting, problem, actions and resolution. Ask an expert Q&A Kerri Abbott naturopath, nutritionist and herbal medicine practitioner of Sunshine Coast Naturopathy Are there foods pregnant mothers should avoid eating, if so what are they? Yes, there are a 2ew I recommend you avoid. Mostly because o2 bacteria such as listeria and salmonella that can damage your baby in utero, sometimes without you even showing signs o2 illness yoursel2. Caffeine: limit to two cups o2 co22ee daily and avoid energy drinks with ca22eine. Alcohol: even small amounts can a22ect your babyws brain development. Raw or lightly cooked meat or ﬁsh: including sushi and pate. Soft cheeses and unpasteurised dairy: brie, camembert. Raw or undercooked eggs: hollandaise sauce, homemade mayo, poached or scrambled eggs. Leftovers: should be eaten within 24hours and reheated thoroughly. Pre-made salads: the longer they have been sitting the more chance o2 bacteria. Tuna, Shark, Swordﬁsh: They contain high amounts o2 mercury which can damage your babyws brain. Junk Food: low in nutrients, high in sugar, salt and calories. Artiﬁcial Sweeteners: experts are divided about the sa2ety during pregnancy o2 artiZcial sweeteners, like aspartame and sucralose. With this in mind, I recommend the use o2 sugar or honey whenever possible. Sugar – chromium and energy Better option – 2ruits, cheese, broccoli, protein and good 2ats °reasy 2oods – calcium Better options – cheese, lea2y greens, nuts and seeds, good 2ats Just as common is 2ood aversion. uite o2ten pregnant women, particularly in their Zrst trimester, will develop an aversion to certain 2oods because the smell or taste makes them more nauseous. Meat is a common one. I2 this is the case, it is important to replace meat protein with plant3based protein such as chickpeas, lentils, legumes in your diet to ensure adequate protein 2or the growth o2 your baby and maintenance o2 your own body. Sometimes pregnant women get cravings 2or dirt or clay. This is known as pica. It can be a mineral deZciency sign. Ensure you are consuming plenty o2 vegetables and that your pregnancy multi has all the recommended amounts o2 minerals included. Dr Linda King Moffat Beach Vets What are some of the advantages of a child having a pet? are many things you need to consider be2ore making your Znal choice. Pets need lots o2 care and attention, and not all animals make suitable pets. When choosing a pet consider the time you have available to care 2or, exercise and play with your pet. How much money can you a22ord to spend on 2ood and veterinary care? Do you have the space in your home 2or the pet o2 your dreams? What are some strategies to introduce a long-term pet to a newborn baby? Dogs need more time 2or play and training. Even small dogs need to be able to run and explore their outdoor environment. A cat, a mouse or rat, a guinea pig, a budgerigar or a Zsh would make suitable pets i2 your 2amily is busy or live in a small home and have less space 2or your pet to play. separation. Nightmares are not uncommon, as well as rebellious or aggressive reactions to other children or their parents. Whilst the separating parents are grappling with their own di2Zcult emotions, itws imperative to remember the children might be reacting with distress and need your special attention. With time and attentiveness, these behavioural problems disappear. I2 there has been abuse or their reactions persist over a long period, it is best to seek some pro2essional help. How should I introduce my child to my new partner? °ive the children an age3appropriate honest account o2 any change as you strive to create a constant sa2e and stable environment. Children need time to adjust to their parentsw split and it can o2ten take over a year to get over possible anger, sadness and 2ear 2rom grie2 or loss. I2 you introduce your children to someone who you are dating casually, this may complicate their adjustment to your divorce. Keep in mind that just because you are smitten with your new partner, your children might not be as positive about it. Keep to the child's routine as much as possible throughout the transition to introducing a new partner to support normality and security. A2Zrm your child how much you still love them despite the distraction o2 a new person around. I2 your child is o2 su2Zcient age, you can even ask them how they would like to be introduced+ A special treat o2 an outing to a neutral place such as a 2avourite restaurant, park or activity can be a 2un idea. A win 2or children and their mums. in parenthood. You may be a tad twitchy with talk o2 bedtime, but we promise wewve got good news. A recent study into the e22ects o2 childhood sleep on parents has revealed that children who go to bed earlier have healthier mothers. We know... it seems pretty obvious, right? And youwre correct – more sleep 2or kids means more sleep 2or their parents, so theywd be healthier, yes? Correct. But therews actually scientiZc backing which means we now have a mission which Zts in per2ectly with our Friday night plans. Lukas with his mum Holly on his ﬁrst day of school. and adds thickness to the pre2rontal cortex and insula. Pay attention to your breathing, heart rate, muscles, 2eelings and desires and the le2t hemisphere o2 your pre32rontal cortex turns on and prevents your right hemisphere 2rom obscuring with negativity. dedicate to nurturing your spirituality? There is power in silence, meditation and prayer. Even just a 2ew minutes a day can make a di22erence+ When we meditate, our mind naturally begins to relax and "sink" into deeper levels o2 rest. This encourages you to approach li2e with greater clarity and 2ervour versus becoming easily overwhelmed and anxious by challenging tasks such astaming lions in a circus or parenting. Same thing really. Iwll “sink” deeper into explaining why. Isnwt that a great reason to dedicate time to engaging with your spiritual sel2? In the white matter o2 the brain, therews a 2atty substance called myelin. It is a “sheath” that protects nerve Zbres, inhibits energy loss, and helps in2ormation move along neural pathways. When you repeat an activity, the myelin coating thickens and in2ormation travels 2aster along those neural highways. Moving 2orward you dedicated, hard3 working parents give your brain some peace by sitting on the rocks by the beauti2ul ocean and talking. So, i2 being open with our children about money is the best policy, how do we do it without overwhelming or stressing them? Dan suggests introducing budgeting literacy to children 2rom as young as Zve, and slowly building their knowledge through practical techniques rein2orced at home. These can be things as simple as playing games where the exchanging o2 2ake money is used or allowing your kids some pocket money. When your kids want to spend their money, make them physically take the money out o2 their savings jar, take it to the shop and hand it over to the cashier. This physical process will help them understand the concept o2 ‘paying 2or thingsw much more e22ectively than just telling them. Snorkelling The ocean o22ers an endless list o2 activities to keep even the most restless o2 kids occupied. And one o2 the best ways to explore it is by whipping out the trusty old snorkel, mask and Yippers. Coral ree2s, Zsh species, turtles, crabs and the occasional harmless angel shark are just some o2 the creatures you and your kids can check out whilst exploring the regionws underwater playgrounds. The Sunshine Coast has a bunch o2 great rock pools and ree2 drop3o22s that are close enough to shore 2or kids to swim out to. Try some o2 these spots 2or your next adventureó Shelley Beach Rock Pools, Neil Street peak at the rocks between Mo22at Beach and Dicky Beach, Mudjimba Island (the western end o2 the island6, Moreton Island Wrecks (try going with a tour company 2or this one, as sometimes the currents between the shore and the wrecks can be quite strong6 and Raper Shoal. Raper Shoal is about hal2 a kilometre o22 the beach at Currimundi, so perhaps itws better suited 2or older children with strong swimming abilities. The site is a large rocky 2ormation surrounded by plenty o2 sand. The top o2 the rock is covered in some great coral and interesting marine creatures are always exploring around the edges o2 the drop3o22. Like any swimming activity, ensure all children are accompanied by a responsible adult and be sure to take extra care whilst swimming in the ocean, as currents and marine li2e can be unpredictable. Botanic Gardens I2 you need a break 2rom the sun, sand and sur2 why not retreat to a nearby jungle sanctuary? The Sunshine Coast has three spectacular botanical gardens 2or local and visiting 2amilies to explore. Each o2 the sites o22ers a distinct landscape and unique attractions. The largest o2 the three, the Maroochy Botanic °ardens stretches across a whopping 823hectare property. Itws home to an abundance o2 wild animal and showcases some o2 the regionws most spectacular native plants. You can expect to see a creek3side rain2orest, lagoons, water 2eatures, rock and palm Zlled gullies, the headwaters o2 Mountain Creek and an open eucalypt 2orest – where you might spot a sleepy koala hanging about. I2 youwre located 2urther north then you most deZnitely need to check out the Noosa Botanical °ardens. Here your 2amily can explore lily ponds, childrenws playgrounds, the 2ern house, large lawn areas and then Znish o22 the day with a game o2 charades at the °reek style amphitheatre overlooking Lake Macdonald. Splendid+ Over in another corner o2 the Sunshine Coast lays the iconic Maleny Botanical °ardens. These gardens are just that extra bit special (without playing 2avourites too much6. Because not only do they open up to stunning views o2 the °lass House Mountains, but the site also hosts three separate walk through bird aviaries. From Znches, cockatoos and lorikeets to exotic parrots and mawcaws, there are more than 700 birds that call these aviaries home. Please note: Entry to the walk3in aviary is through guided tour only departing at 10.30am and 11.30am daily. Kids get free entry to the Maleny Botanic Gardens (fee applies to avairy) however entry fee applies to adults. Sand Tobogganing While we donwt see snow during the winter months, wewve got the next best thing – sand. As it begins to get colder, spending hours in the water a2ter school or work becomes a little less appealing, so why not utilise the other hal2 o2 the beach? °rab your boogie board and head to the Carlo Sand Blow at Rainbow Beach. You can slip and slide all day long and tumble roll down the sand hills. Itws almost guaranteed that you and your kids will be in stitches a2ter one o2 you stacks mid3ride and 2ace plants into the sand. However, be care2ul not to take on any old hill. Sand dunes throughout the region such as at Point Cartwright are precious nesting spots 2or turtles and are in re3vegetation stages. 10 minutes with each one o2 your children, talking about their day and whatws on 2or tomorrow and have that really nice one3on3 one time, then youwre already going to 2eel a lot better. Because really, everything else can wait,” she said. Previously having worked as a teacher be2ore going on to study accounting and eventually starting her business, Kendall has worked in an array o2 di22erent roles throughout her childrenws lives both at home, 2ull3time and part3time. She admits society has somewhat progressed in creating ‘2amily32riendlyw workplaces but believes there was a lot more work to be done. “I was very passionate about breast2eeding and I 2ound mysel2 breast2eeding children in 173minute lunchbreaks in carparks. And we are talking about organisations that label themselves as ‘2amily 2riendlyw,” Kendall said. “So, wewve deZnitely got a long way to go. But as a mum you end up with great skills to o22er the work2orce. I2 you show your employer just how great you are, then your employer will naturally bend over backwards to keep you because trust me, itws really hard to Znd great sta22.” For this mum, she believes shews hit the absolute jackpot. Shews working her dream job and still relishes in every special moment shared with her children. In 2018 Kendall Morton was named the region’s Outstanding Business Woman of the Year. QLD Government funding through Higher Level Skills and Certificate 3 Guarantee Program. FEE FREE TRAINING FOR YEAR 12 GRADUATES. CALL TODAY! Supported through the Queensland Government. *Concession rates. Eligibility and subsidy criteria apply. Getting your children outside is one of the best ways to teach them about caring for the environment and how they can make a positive impact. There are numerous ways to get them involved with projects that help promote sustainability and reduce landZll. Creating a compost system with the kids is a 2un and easy way to get them excited about recycling. Although composting is a simple process it is also a great introduction into the world o2 science, especially biology, chemistry and physics. Steps to creating your compost Build or purchase a compost bin 2rom your local hardware store or contact your local council 2or one. Children will get more 2rom the experience i2 they can help choose their own composting container. Two Think about where your compost bin will be located. There may be some 2unky smells coming 2rom your bin so you donwt want it too close to areas where you and your kids hangout. Three The best compost is made using a variety o2 materials. It's important to use 2ood scraps and small amounts o2 grass clippings (which are usually high in nitrogen6 together with lots o2 dry leaves, shredded paper and cardboard (which is high in carbon6. It's also a good idea to add a 2ew hand2uls o2 a pelletised chicken manure (such as Yates Dynamic Li2ter6 to each new batch o2 compost, which provides 2ood 2or the composting microorganisms. Four Regularly sprinkle the compost with water to help keep it moist. Five An aerated compost pile or bin, where air has access to the organic matter, will decompose much 2aster and have less odour than compost which is starved o2 air. Aeration can be done by regularly turning a compost tumbler or mixing the material in the compost pile or bin with a garden 2ork. Alternatively, you can place garden stakes or pipes through the pile to help air reach inside. Food scraps, garden waste and shredded paper and cardboard can all be composted. ChiCKen mayo nori rolls Serves 2 Ingredients ☻ 1 cup BB chicken (2inely chopped6 ☻ 3 tbs Japanese mayonnaise ☻ 1 tbs 2resh mixed herbs (chopped6 ☻ 1 sheet sushi nori seaweed ☻ Â carrot (julienned6 ☻ Â Lebanese cucumber (julienned6 ☻ Â avocado (sliced into strips6 ☻ 30g baby spinach Method STEP 1 Combine 2inely chopped chicken with mayonnaise and herbs. Season well with salt and pepper. STEP 2 Place a nori sheet shiny side down on a bamboo sushi rolling mat. Spread hal2 o2 the chicken in a thin layer along hal2 o2 the nori. STEP 3 Place vegetables evenly on top o2 the chicken. STEP 4 Roll sushi, using the bamboo mat to press 2irmly. Brush edge o2 nori with water and continue rolling so that the edges seal shut. Slice sushi and place in lunch box. riCe CaKe oWl Ingredients ☻ 1 slice meat o2 your choice (chicken, ham, etc.6 ☻ 1 rice cake ☻ 1 boiled egg ☻ 2 sultanas ☻ 1 slice o2 cheese ☻ 2 slices o2 cucumber ☻ 1 carrot stick Method STEP 1 Lay meat on top o2 rice cake. STEP 2 Care2ully slice your boiled egg and use the two middle slices as eyes, place sultanas on 2or eyeballs. STEP 3 sing a kni2e cut a small triangle 2or the beak and 2ashion 2eet out o2 cheese, as shown in picture. STEP 4 Cut one cucumber slice in hal2 and use as wings, then with another slice make ears. STEP 5 Once positioned on a plate, place a carrot lengthways underneath the owl to serve as a tree branch. leave out 2or you to step on? Well you can hire out a whole heap o2 them and throw your child a LE°O extravaganza. Bricks 4 Kidz hosts di22erent LE°O3themed events 2or kids, with all the bricks provided, a range o2 activities and games and a guide to help them along the way. Fairy-tale sleepovers °oing to a sleepover at 2riendws place has been made even more special with the help o2 a duo who host organised slumber parties. The team at Slumber Sisters set up teepees, bring in themed decorations, matching pyjamas, candles and candy and anything else needed to add that extra touch to a slumber party. Amusement hires To add an extra element o2 2un to the backyard party, why not hire out an inYatable castle or a bunch o2 mini Jeeps? °et the kids burning o22 their sugar high and hire out a jumping castle, blow3up obstacle course or inYatable slide. The guys 2rom Pumped p Fun have a whole range o2 2un, adventure3packed amusements and rides to bring that element o2 excitement to the party. their bestie or invite their whole tribe over and parents donwt have to worry about setting up a thing. pits, tumbling over obstacles and walking balancing beams, then consider hiring out some so2t play equipment. Cheeky Little Monkeys is a so2t play hire business that caters 2or children 0 3 Zve year old's 2or all types o2 events and parties. Fairy tea parties What better way to celebrate your childws birthday then to bring their 2antasy to li2e in your own backyard. The team at The Fairy Toadstool provide everything you need to throw your very own 2airy tea party, complete with toadstools and 2airy dust. There will be 2airy 2ace3painting, bubbles, dancing and cups o2 tea paired with a 2airy party3cookie; everything needed to have a magical birthday. Food Itws o2ten the thing that can make or break a party, so you want to make sure you get it right. Not enough 2ood and you will have some hangry youngsters on your hands and i2 itws not catered to the right crowd you will have a bunch o2 2uss pots re2using to eat your hand3made gluten3 2ree, sugar32ree, dairy32ree cucumber sandwiches. Keep it simple with 2amiliar snacks like pizza or sandwiches, which can be turned into special party 2ood by using cookie cutters. Try making star3shaped sandwiches or heart3shaped pizza. I2 parents are dropping o22 children at the party, be sure you know about any 2ood allergies. Invitations These are important as the little tikes arenwt going to get to your party i2 they donwt receive an invite Zrst. Make sure you order personalised invitations six weeks be2ore the party. Send out invitations at least three weeks ahead to ensure guests get back to you in time and you can plan 2or the right numbers. You can also download and print invitation templates online to save money and minimise e22ort. Games As well as 2ood, games are just as crucial to ensure 2un times are had at a childrenws party. I2 your child is old enough, sit down with them and o22er a 2ew suggestions 2or the birthday party theme. That way you avoid any disappointment i2 they really wanted a dinosaur theme, but you went with a 2airy picnic3inspired event instead. Think ahead and cater 2or your crowd; so age3speciZc games. child's party depends on whether you want to serve a party meal or cut straight to birthday cake. Toddlers arenwt as likely to engage in the same level o2 games as the older children so make sure you have all bases covered. I2 serving a meal, start the party between 11.00am 312.30pm or 5.00pm 3 ø.30pm. hoW to raise an adult Itws one thing to help guide your child through li2e and another to over3parent. Otherwise known as ‘helicopter parentingw Julie Lythcott3 Haims uses research, conversations with experts, and her own insights as a mum to highlight just how this type o2 parenting can actually do more harm than good. oh CraP! Potty training Worried about toilet training? Let Jamie °lowacki show you how itws done. Her six step proven process to get your toddler out o2 diapers and onto the toilet has already worked 2or tens o2 thousands o2 kids and their parents. ovia PregnanCy Are you expecting? Watch your baby grow with Ovia Pregnancy. Ovia's personalised approach to tracking gives you an app as unique as your pregnancy. From pea size to 2ootball size, you can choose a theme that helps you keep track o2 your babyws growth in a 2un interactive way. Happi2yws science3based activities and games can help reduce stress, overcome negative thoughts and improve overall health by providing tools and programs to enhance your mental wellbeing. Enhance your spaceó Your home is your sanctuary and sometimes adding subtle changes to a roomws dcor can completely trans2orm it.